China's Tencent Games is releasing a new MMO called Age of Guns. The game features a dual-wielding hero that looks like it was picked up from the Japanese character design reject pile. But check out the Age of Guns' newest trailer. 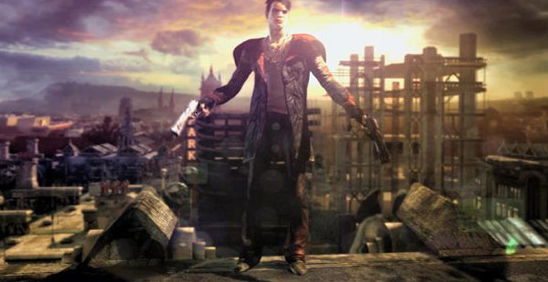 Ninja Theory, the developer behind DMC, doesn't seem pleased and even pointed out the similarities on its Twitter page. The trailers are in the above gallery. Judge for yourself. Can the chinese ever be original? Here's a deal. How about you stop being a redneck bigot and they'll try and be original again, like they were for thousands of years when your ancestors were working out which end of a stick to scratch their bum with. I don't think Gaz was being racist mate. Well actually making generalisations about a group of people based on their race is pretty much the definition of racism, so he kinda was. But cegorach is too so I guess they cancel each other out. Plus there is so much copying in the games industry I am surprised this was worth an article. It is just taking from every cliche manga and action movie over the last 15 years so big deal. We can assume you don't understand what irony is then. Technically, the definition of racism is treating one race as inferior to another. I'm not helping the Chinese here; their ways of copying other people are well known, but what we're talking about here is four seconds of similarity; I think Ninja Theory is being a bit too sensitive. Yeah, I don't think Devil may cry (much as I love it) has exclusive rights to 'Anime guy with two handguns and slo-mo', so China's "copyin" here is excused. Before this awful non-article gathers any more steam it would be pertinent to suggest that the akimbo pistols/stylish flying around on wires was popularised in the modern consciousness by CHINESE people way before the Japanese started developing DMC. John Woo and Tsui Hark frown on your culturally xenophobic shenanigans. I think the point of the article was more "Game dev copies game dev" and not "Nation copies nation"..
Really. That's why each article starts with 'The USA's Double Fine' or 'France's Ubisoft', eh? I think the point of the article is how unconscious bigotry is still bigotry. Yeah, but Ubisoft and Double Fine are well-known studios.. I think in this case saying that Tencent Games - who I'd never heard of before - are Chinese, is not really bigotry. I can see how that could be implied, though I didn't read it that way. Hmmm... Not as bad as Gameloft. Not to white-wash anything here, but from the unlicensed Transformer/WoW theme parks, MMOs and KIRFs, it's no secret that the Chinese have very different copyright standards, there is no such thing as intellectual 'property,' yet I can tell I'll be accused of bigotry for pointing out the elephant in the room. It's the same fallacy in the US, where perceiving racism is as bad as actual racism. Those last few seconds are pretty darn similar.